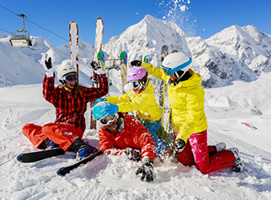 Our all inclusive Ski Packs for Livigno are an ideal way to budget for your skiing activities, so there'll be no surprises when you arrive in resort and you can get straight on with enjoying your holiday. Both the options below include lift pass (points card for beginners), equipment hire and tuition. If you'd like to book items individually, please see our Lift Passes, Ski School and Rentals pages. To tie in with the Livigno Ski School, our Ski Packs typically start on Sundays. If you arrive on a different day, please send us a message. This option is for complete beginners only and includes a points card pre-loaded with 400 points, six days of equipment hire and six days of lessons. Each lift has a points value, for example the lifts in the beginners' area take about six points from your card each time you use them. The more you ski the more points you'll use, so this option is aimed at novice skiers who aren't sure how long they'll take to find their ski legs. If you run out of points, you can top the card up for around €25 for 100 points. At the end of the week, if you do have any points still on your card you can get them refunded. This option again includes six days of equipment hire and lessons, and an Livigno area lift pass giving you unlimited access to all the lifts in Livigno throughout the week and is suitable for anyone.